Sunday December 6 1908 There was a heavy snow to clean of this morning and while Will did that I was busy with the house-work. I wrote up this book for two weeks before dinner, and in the afternoon I wrote a letter to Lou Reeves Simpson. I read most of the evening. Monday December 7 1908 It was very cold I did the work and sewed on pillow cases I am making for the church fair. I kept at that in the evening. Will busy about the place taking care of the stock. 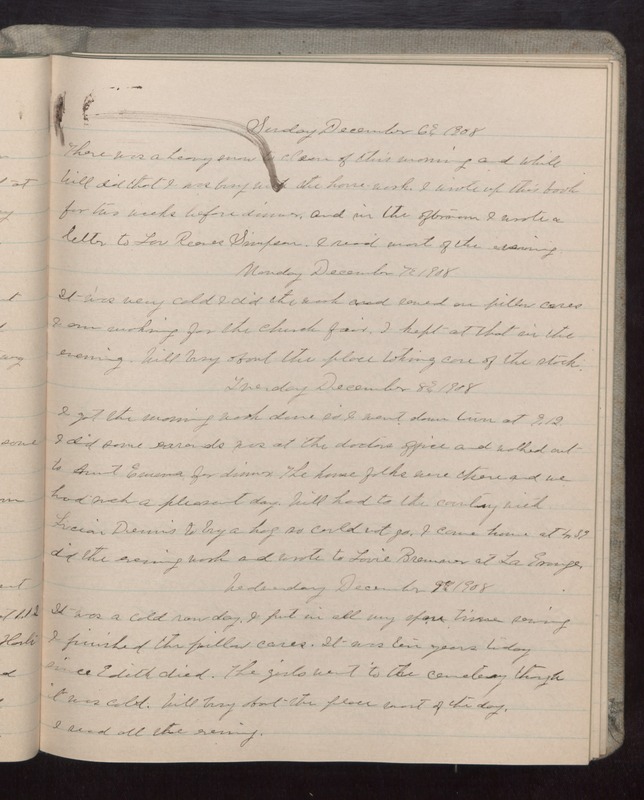 Tuesday December 8 1908 I got the morning work done so I went down town at 9.12 I did some errands was at the doctors office and walked out to Aunt Emma for dinner. The home folks were there and we had such a pleasant day. Will had to the county with Lucian Dennis to buy a hog so could not go. I came home at 4.39 did the evening work and wrote to Louie [Bremer?] at LaGrange. Wednesday December 9 1908 It was a cold raw day. I put in all my spare time sewing I finished the pillow cases. It was ten years today since Edith died. The girls went to the cemetery though it was cold. Will busy about the place most of the day. I read in the evening.